The Chaos Earth® Role-Playing Game was just the first step in experiencing the cataclysmic birth of Rifts Earth. 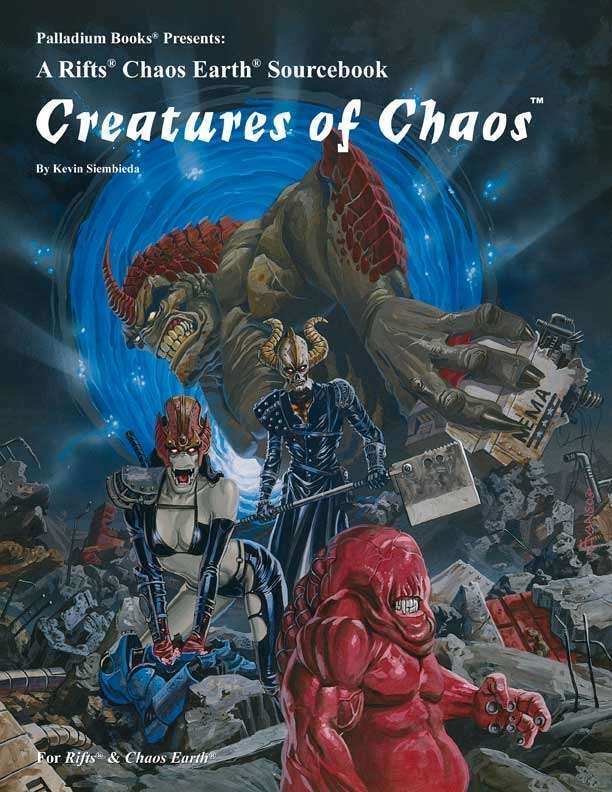 Creatures of Chaos™ is the next. The Demon Plagues are the second wave of destruction to wash over the Earth and shake the foundation of human civilization. The Rifts are spewing creatures from nightmare dimensions bent on the torture and destruction of humankind. Creatures best described as demons – enemies of goodness and destroyers of life. These are the villains that NEMA’s heroic champions must face as they struggle to hold together the last threads of civilization. Player characters make their place in Rifts® history as the world they once knew rapidly continues to mutate into something alien and bizarre. Nothing is quite as it seems, and even the light of day is not free of demonic raiders. Overview and introduction to the Demon Plagues of the Great Cataclysm. NEMA’s place in the expanding drama of the end of the world. Nearly 30 new and different supernatural beings. Day Demons, Night Demons, World Slayers and more. For use with Rifts® Chaos Earth®.